Besides their love for their Sphynx cats Luka and Loki, Kenny and Christi are completely in love with their best friends - each other. These two knew each other all the way back in elementary school when Christi actually hated Kenny! Luckily, she decided that her opinions at 7 years old my not have been correct, and gave him another shot! I loved getting to know these two over coffee a few months ago, and quickly realized that if you ask Kenny about his cats and he lights up - but not quite as much as he did all. day. long. at his wedding. There’s not a single photo he’s not smiling in - be it that he felt super shy and awkward, or my favorite explanation, that he was totally in love with his bride and having the best day ever! There were so many sentimental touches at this wedding, and a lot of really sweet tributes to Christi’s late father and brother. Her bridesmaids showered her with touching gifts such a shoe charms with these men’s initials and birthstones so they could “walk her down the aisle”, a beautiful bracelet featuring a portrait of her brother, cameos of her brother and father on her bouquet, and her brothers watch, which she presented to Kenny as a gift for the morning of the wedding! (I had strict instructions that the only stipulation with the “watch shot” was that Kenny take off his Livestrong bracelet for the photo, and I didn’t even have to ask him! Already learning that a happy wife = a happy life!). The rose and burgundy touches and chocolate kisses favors at the tables gave this sweet wedding a Valentine’s vibe without being over the top. White fitted chair covers rented from White Lace totally transformed the Rustic Lodge. I had my wedding there too almost 7 years ago and was shocked at the change these seat covers made! I also had serious envy of her blush pink Moraliee by Madeline Gardner gown and totally would have picked the exact same one if I could get married all over again!! Christi also did her own stunning wedding makeup and hair and it was absolutely perfect! She shared with me that she honed her skills watching YouTube videos and practicing on her mom! I hope you enjoy all of my favorite highlights from this sweet day! One of the first decisions you will make as an engaged couple besides your date and venue will be who’s in your bridal party! It can be hard to narrow down the list, especially if you have lifelong friends from high school, college, work, or even family that are like best friends. Where there’s no “rule” for who to include and who to not, I can share a bit of insight into my approach from when I was in your shoes 7 years ago. Remembering that your wedding is one of the biggest, most significant days of your adult life, you want people there to support you. That’s the whole POINT of a bridal party - to surround yourself with people who will support and help you create amazing memories on your wedding day AND pledge to live life with you in the days after, both good and bad. I chose people that were vital parts of my childhood and high school years - my best friends that stayed the test of time. I chose people that were also close to me at the time, having moved to a new town and made friends there the past year. Has my friend group changed since? Of course. But I have no regrets with who I chose to be involved in my wedding day because they were so significant in supporting me through different seasons of my life. What if the Maid of Honor or Best Man isn’t good at planning? If your “best friend” isn’t quite on top of things and the thought of them coordinating something like a shower or bachelorette party seems laughable, just have an honest conversation with them. Being the Maid of HONOR doesn’t necessarily mean the Maid of Responsibility. Ask them what they would LIKE to do and realistically could do. Being your best friend, they should understand, and feel honored that you want to make sure their responsibilities play to their strengths. If there’s someone really “type A” in your bridal party that would LOVE to plan and organize, have them be the logistics. Your maid of honor can still make decisions and offer the ideas, but there’s nothing wrong with having someone else be the “do-er.” Your Maid of Honor can still HONOR you by sharing a toast at the reception, getting you a special gift, reading a passage at your ceremony, come with you to dress fittings to learn to bustle your dress, or any other important job you feel is appropriate! How do you easily share the cost of things? At the end of each event, Mary would take the total spent by everyone and split it 9 ways. She would then “invoice” us if we still owed for our portion of the total expenses, or “reimbursed” us if we spent more than our share. For things like going out to eat where everyone pays for themselves, she would pay for the brides meal and we would reimburse her for our part of it. Having people set up with Venmo or PayPal accounts made transferring money super easy! What if everyone lives far apart? Start. Planning. Early. 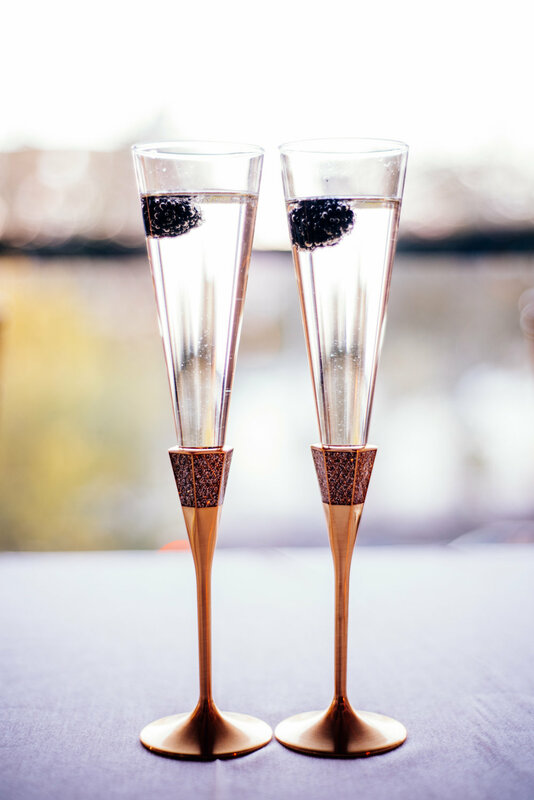 It might seem crazy to commit to a weekend a whole year out just for a shower or a bachelorette party, but doing so will increase the chances that everyone can be there. And if they can’t? You as a bride have to have grace for those who can’t financially commit to traveling in for every event. Your friends are going to spend hundreds on their clothing and their share of all the fun events before the big day, so you can’t begrudge them for wanting to cut down costs by not buying a few more plane tickets. If possible, host them at your apartment or house to cut down on their losing expenses! Another great thing to consider is WHERE to get your gowns or tuxes/suits. While it may be tempting to shop local (and in any other case, yes! Do it! ), this is one decision that may be best handled by a big box chain store like David’s Bridal or Men’s Warehouse. You can decide the color, the style (if you want), and any accessories, and then your girls or guys can go to the nearest franchise store (bonus points if you choose a place within an hour of each of their homes!) and ensure everything will match. Shipping times at these stores are usually a lot faster too, which is always good! How do you make sure wedding day isn’t chaos? Remember, these are the people you love the most, and with open communication and planning, I promise that having the squad there, however big and crazy, will be as sweet and as fun as you are imagining it to be! 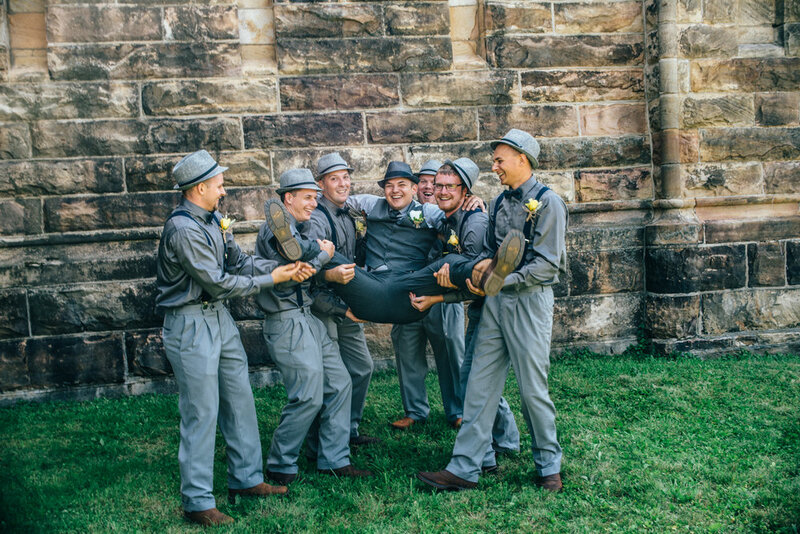 Check out some of the fun memories my couples shared with their big bridal parties!! And be sure to check out other blogs fulls of similar great advice for planning your wedding! From our incredible time in Waco, Texas shooting my first destination wedding! This year was iconic for me in starting to realize my dream of being a destination wedding photographer! Cody and Faith were so kind to invite us to Waco Texas to shoot their incredible wedding in June, and while nothing else can really beat that, a few venues back here in Pennsylvania came close! 2018 took me to weddings at PNC park, the Renaissance Hotel, Jumonville, a city rooftop, country clubs, beautiful local barn venues, a private horse farm, a sheep farm, a cattle farm (lots of farms this year! ), and a romantic outdoor campsite just to name a few! How incredible it is to be a photographer!! I was so blessed to shoot a total of over 40 family shoots, 8 senior sessions, and 22 weddings, some as a second shooter with amazing local photographers like Karen Plate Photography, j.jae photography, Carolyn Renee Photography, and Sparks Ignite Photography. I got to attend two workshops, one right here in Indiana PA hosted by the awesome Jon Blanchard, and one in New Jersey hosted by the girls of NJ Spark! This was a big year of knocking out some big personal projects like creating a wedding magazine chock full of advice just for my brides, converting to all digital contracts for the convenience of my clients, a styled shoot in coordination with j.jae.photography, and over original 30 blog posts! While it’s certainly a struggle to keep the momentum going in the off season, the sheer volume of exciting people, experiences, and images that I’ve had this year make me fall in love with photography over and over again! I can’t wait for 2019 and some of the incredible places (Lingrow Farms!! South Carolina!!) that it will take me!! The Renaissance Hotel in Pittsburgh is a gorgeous venue to have your wedding - with a sweeping grand staircase, cozy but elegant reception room, and incredible views of the city from it’s modern suites, it’s everything you could want for your wedding AND after! Not to mention the city’s most iconic yellow bridge, The Roberto Clemente, just steps away from its doors. Even though this wedding was early in early November, we really got lucky with a gorgeous and vibrant Pennsylvania autumn where the leaves decided to change AFTER Halloween, giving us some of the most stunning and colorful fall wedding portraits! Andy and Megan were some of the sweetest people I ever had the pleasure of working with! These two met when they were I grade school, and I was thrilled to learn that Andy’s older brother got the very special job of being their chaperone when they were dating!! Andy and Megan also went to college together, and needless to say they are best friends - you can that tell right away when talking to them! In fact, they are so precious together that it was hard for me not to ball behind my camera seeing Andy so emotional over seeing his gorgeous bride for the first time! The timeline for this one was very unique but made my life sooo much easier as the couple opted for a first look before the evening ceremony! 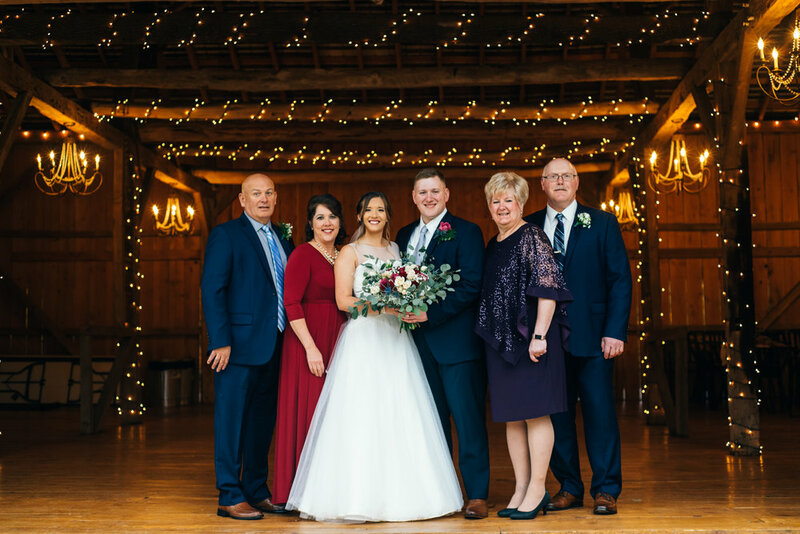 Megan and her mom made really smart decisions about the when and the where for photos, renting photo time at the beautiful Barn at Rayne Run in Marion Center for the first look and family photos before everything got started. Then, the ceremony and reception were at separate locations that fit the size of their crowd and the time of the year! Just wait until you see the vibrant orange trees at the barn!! These two have a beautiful future ahead of them, all built on a strong foundation of faith. Andy is planning to be a Chaplain in the military, and Megan’s parents both work in the church they were married in! I Megan’s grandpa was also a minister and co-officiated their beautiful ceremony in Clymer! I hope you love some of the highlights of their day - and as a fun bonus I threw in the snapchat video I took of us as we drove to the ceremony!! Driving the bride to her ceremony! 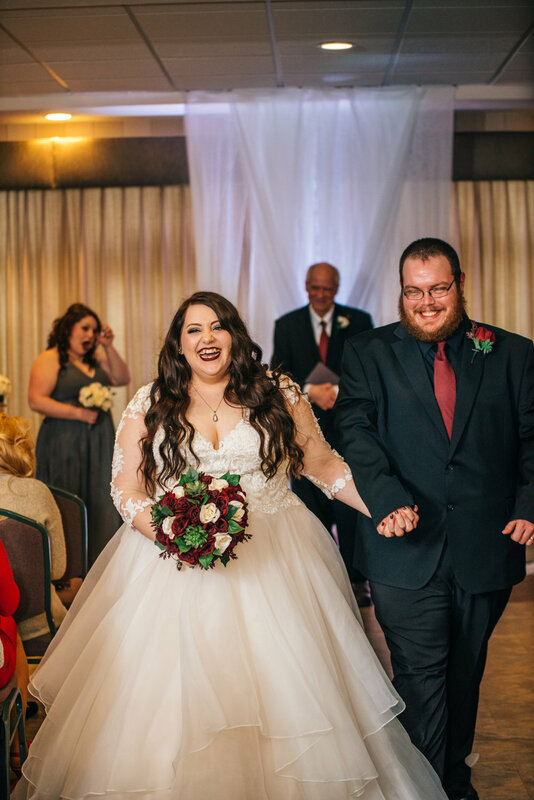 Whitney and Quinn had a beautiful fall and winter themed wedding at the Windber Country Club in Salix this past October. 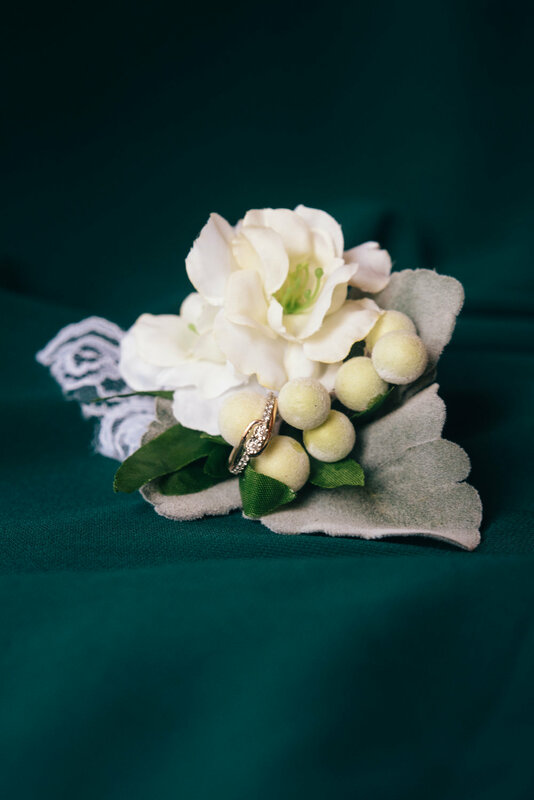 With lots of jewels, white pumpkins, pearls, ivory and red, her decor was equal parts Cinderella inspired and charmingly rustic with colorful nods to the upcoming Christmas season! There were also so many special moments with family, including a lovely ceremony officiated by Whitney’s grandpa, and her younger brother Nebraska stole the show on the dance floor all night! 6 years ago I was lucky enough to photograph Whitney for her senior photos where we had lots of fun wading in streams for some unique shots - and she was just as adventurous as a bride! Her 4 inch heels didn’t stop her from walking around the golf course without fear, and when we found a mushy spot, her Prince Charming picked her right up and carried her! I hope you enjoy some of my favorite shots from this fun and unique wedding! You spend hundreds if not thousands of dollars on your wedding gown, and hopefully that cash means you feel like a million bucks on your big day, so why should the fate of your gown be a dark and lonely one in a garment bag in the back of your closet? It's becoming more and more popular for couple to schedule anniversary sessions where the gown gets to come out of retirement, and a bride gets to feel just as special as she did on her favorite day. 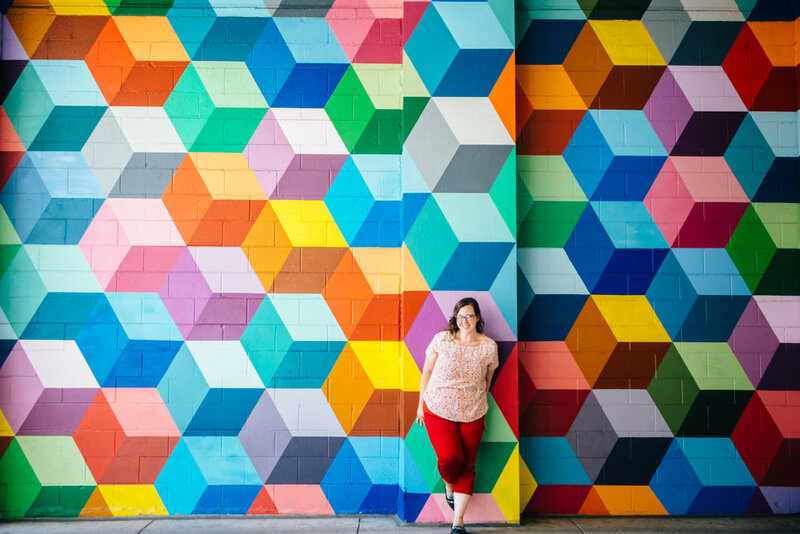 A few of my friends have done this, and if I still had my gown I totally would (more on that HERE), so when Kelly approached me about doing an anniversary session (I was a bridesmaid for her wedding), I was SUPER excited. We had such fun planning a mini wedding day, Kelly calling on some of the best local vendors in the industry to get her ready for her re-debut as a bride! Her gorgeous, soft up-do was done by Hannah at Cameron's Salon, the stunning makeup was courtesy of BethyMae, and of course, a girl's gotta accessorize! Kelly got a custom necklace made by Rosie at Miss Pie Jewelry! Kelly and I have been close friends for quite some time, and there's not much she loves more than catching up with friends over a cup of coffee from the Commonplace (except shopping, of course. And LuLaRoe). Luckily her hubby also likes coffee, so it was natural that she and Jamison started off the anniversary session with a waltz into this super cool coffeehouse to share a cup in their Mr. and Mrs. mugs! We intended to cut into their cake from yester-year, but none of us realized that it was akin to a delicious frosted glacier and would take several days to thaw out. There's your pro-tip: a week before your anniversary, set a reminder on your phone to move your cake from the freezer to the fridge. 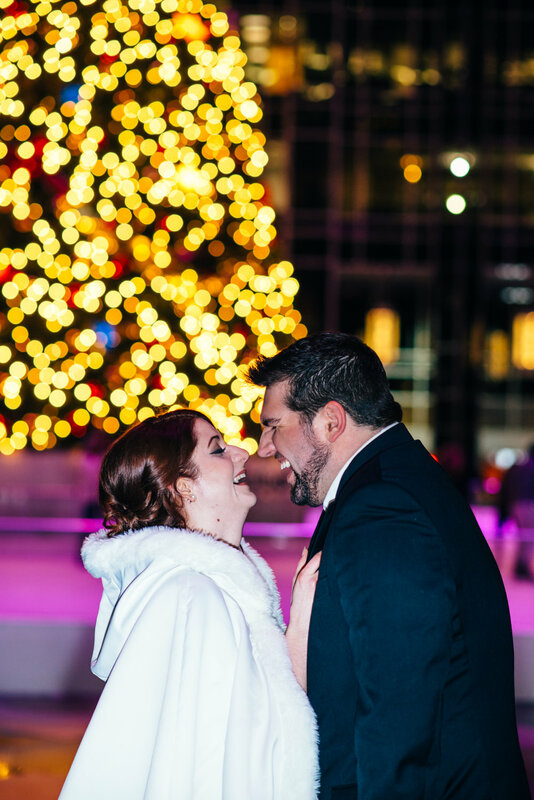 After the frozen cake and the hot coffee (and a few shocked stares from college students cramming for finals), we headed to Pittsburgh to get some magical photos in front of the Christmas tree at PPG Place. As you can imagine, we got some crazy looks as we ran around both Indiana and Pittsburgh in the 17 degree weather in full wedding regalia, but I think you'll agree the end results are worth it! My awesome friend Jackie from J.jae Photography let me try out her super cool Mag Mod flash modifier, and when you throw in the gentle snowfall with this dreamy backlight, well, you just gotta see for yourself! Steve and Brianna tied the knot this past weekend at Brianna’s family’s farm in the beautiful Brush Valley, Pennsylvania, just a few miles down the road from Indiana. I was so excited to photograph this beautiful wedding as soon as I spent a half an hour on the family farm riding around in their ATV a few weeks before the big day. 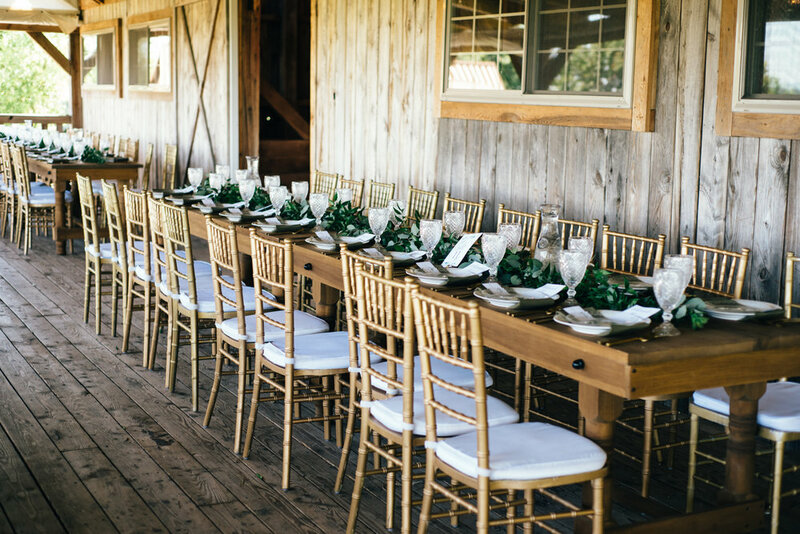 Normally a beef farm, the grounds were transformed to be fit for a sweet and romantic wedding - Brianna’s dad even gave up his hay barn and hung chandeliers that he “might just keep up” now that the festivities are over! One of the best parts of the day, however, was seeing the bride ride in to the ceremony on the hay wagon! The ceremony was held at a small country church right up the road from the family farm - the same church Brianna’s parents were married at! Steve and Brianna met when they attended Penn State, studying agricultural programs, and now live in the eastern part of the state working on a dairy farm. Steve milks the cows and Brianna manages their nutrition. How heckin’ cute is that?! I had no idea how intense dairy farming was until spending some time with these two - which was a rare occurrence since Steve only gets a few days off a year or something crazy like that! He even took a call during photos to answer questions about feeding and started that call with “Sorry I missed you, I was getting married.” For real?!?! He’s so dedicated!!! 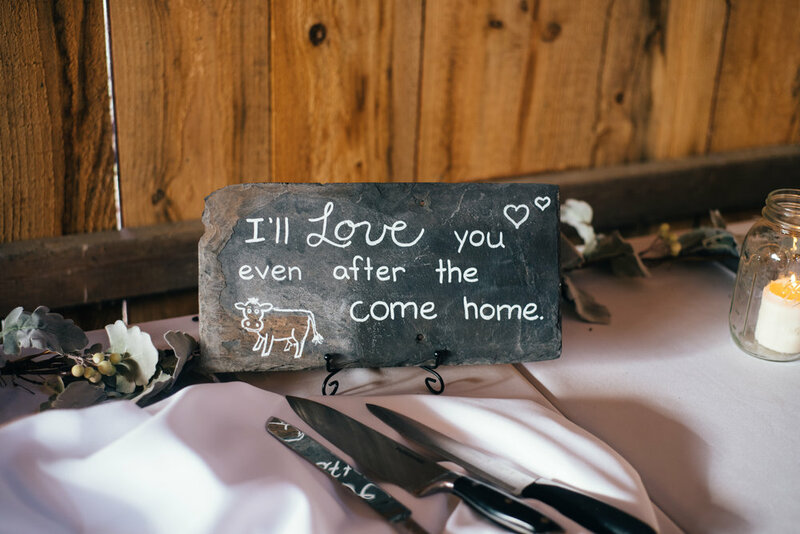 The dairy farmer theme really came full circle for me when I saw all the “dairy” touches at the reception: the “BondsSayIMoo” hashtag, the cheesecake wedding cake, cowtail candy favors, the cute cow decor - but all tastefully done. (Let’s talk about that cheesecake for a minute - this angel of a bride gave me a WHOLE one to take home. Yes, I happily accept tips in cheesecake.) I hope you enjoy some of my favorite shots from the time two dairy farmers said “I Moo.” So cheesy. Yay dairy puns. The thing that contributes most to a stressful wedding day is not having enough TIME!! I’m sure you’ve planned out all of your events and your timeline is perfect (still need timeline advice? Click here for this freebie timeline tool download! ), but that doesn’t mean time won’t be wasted on your wedding day! Wasted time can put a lot of pressure on you, your vendors, your bridal party, and your spouse! It can mean that photos get cut short, dancing gets cut short, people have to rush to get ready, or guests have to wait longer, just to name a few. Have I scared you yet? Not my intention!! Your biggest asset will be having a calm, collected attitude, and the ability to roll with anything that comes up definitely means that you will be totally fine! 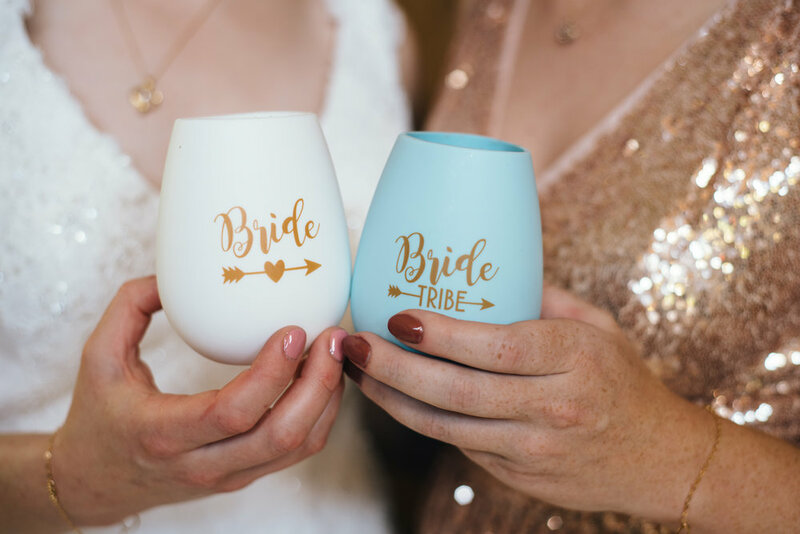 So if knowing event times and details stress you out, don’t worry - share this post with your maid or matron of honor, your mom, or any other trusted friend (but not someone that will turn into a drill sergeant!) to watch out for these minute-hogging pitfalls and to steer clear of them to help keep things moving along. If you’re the kind of person that often says “where’s my _____?”, this one is for you! Two nights before your wedding (yes, two), pack a suitcase of ALL the things you need to get ready for your wedding. Things like undergarments, toiletries (perfume, etc), cell phone chargers, special props for photos, hair accessories, gifts, tips and final payments in their own envelopes, and of course your emergency kit items must all be gathered up well in advance. This is also a great time to make sure all of your details that your photographer will want to photograph are in their own separate box or suitcase. 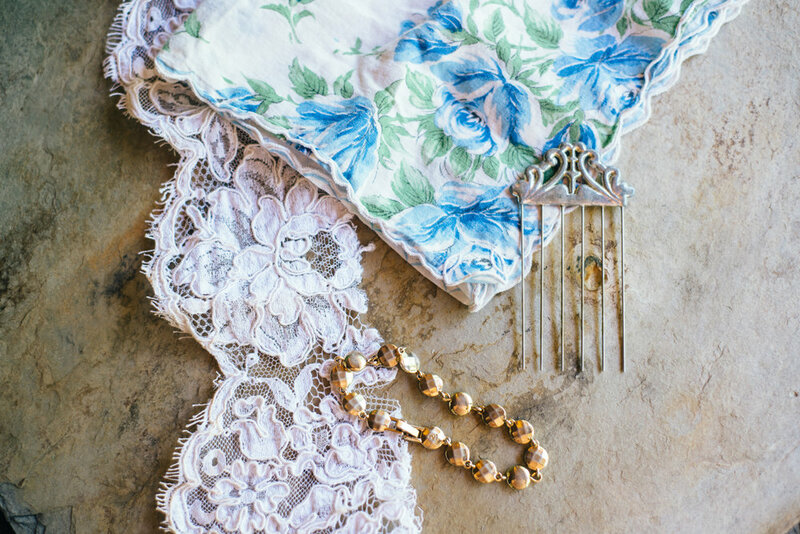 Things like your shoes, jewelry, garters, and invite suite are a great place to start! It’s very helpful to figure out ride situations BEFORE your wedding day. I was guilty of this one too, so no judgement here my friend! Make sure each bridal party member has a seat in a vehicle to and from both the ceremony and reception. If you are doing a shuttle for your guests to arrive at your ceremony, give some extra time for your ceremony to be delayed due to late comers catching the last shuttle, or communicate well and early that 2:00 means 2:00, sorry not sorry! This one is especially important for weddings where the ceremony and reception are at the same location: if you want family photos done directly after the ceremony, let the people who are in them know well in advance. I tell my brides to talk about this with their family and bridal party at the rehearsal, that way, they are already in the mind frame of “sticking around” after the ceremony for photos because they saw and rehearsed it the night before. This is probably the BIGGEST time waster of all, and I would never want you to have to give up a photo because a family member has wandered off. Let them know early, and let them know multiple times! After you finally have Uncle Bob standing in place and the family photos are taken, designate someone that is not in the bridal party or a part of photos to come to clean up the church or ceremony site. Unsuspecting bridesmaids taking time to rip off pew bows and gather up your unity candle will just push the start of photos back. This is also a great point to remember at the END of the night too! Figure out who will gather up all your personal decorations and belongings like your champagne flutes, signs, etc. Don’t get me wrong - I love receiving lines! If giving your guests a hug or a handshake right after you say I do is important to you, then set aside at least a half an hour for it! As soon as the ceremony is over, the photographer’s clock is ticking. Help him or her along by keeping things brief and focused! If you need a restroom break, now’s the time to do it! Let me leave you with this bit of advice: if you surround yourself with people you trust, feel comfortable with, and who are experienced, you will float above any small little ripples that come up during your day. Think of your bridal party, your family, and your vendors like your shield - you don’t have to feel, or deal with, any stressors as long as someone is aware they can happen, and you have breathing room in your timeline to let the day play out as it will.